Ed Allred,became the first Quarter Horse owner to reach the milestone of 1,500 career Quarter Horse victories on Friday at Los Alamitos. 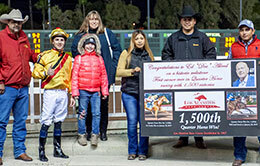 LOS ALAMITOS, CA— FEBRUARY 8, 2019—Ed Allred, Quarter Horse racing's all-time leading owner and breeder, reached another milestone when he became the first owner to reach the milestone of 1,500 career Quarter Horse victories on Friday at Los Alamitos. Allred, a member of the AQHA Hall of Fame, reached the mark with the Scott Willoughby-trained Oatie Three, a gelding by Walk Thru Fire, who sailed to half-length victory in the 100-yard fifth race. Scott Willoughby saddled Oatie Three, who was ridden by Vinnie Bednar. "Dr. Allred is a great man to train for," Willoughby said. "He's great for the sport and has done so many things to keep Los Alamitos and Quarter Horse racing alive across the United States. He's put money out of his pocket for so many things, from insurance to cleaning up the sport across the board. Quarter Horse racing is better off with him for sure." Oatie Three is a full-brother to Grade 1 Los Alamitos Winter Derby winner Oatman and 2014 Cash Rate Handicap winner Old Six Six. He's also a half-brother to Grade 1 Southern California Derby winner Hulapai. "He finally broke and got a good race under him," Willoughby said of Oatie Three. "He ran a very solid race. Last time he broke really well but then he turned left and bounced off the inside rail. He really put it together tonight and Vinnie did a great job in keeping him straight and winning the race." Oatie Three earned $4,285 to take Allred's career earnings to $19,759,655. When he goes over the $20 million mark in career earnings, he'll become the first Quarter Horse owner to reach that plateau. Allred's Quarter Horses have started in 10,648 races, won 1,500 races, scored in 97 stakes. He'll have a chance for stakes win number 98 on Sunday night when He Looks Hot competes in the Grade 1 Brad McKinzie Los Alamitos Winter Championship. 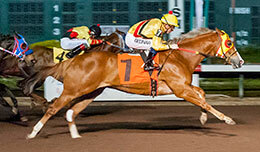 He Looks Hot was recently recognized as an AQHA Supreme Race Horse. His top stakes winners over the years have included Charger Bar, He Looks Hot, Kingman Kid, Way Maker, Twelvie, Forgive Him, Check My Thoughts, Mega Storm, Flare For Toby, Quirky, Don Callendar, Once Over, How Special, Girl Secrets, Private Practice, Really A First, Fourth And Two, Dreaming Sweet, Look Her Over, Citation Five, Up For it, etc. Allred has also won additional races as co-owner, but those wins are not counted in his individual statistics. Allred has won the AQHA champion owner title a record six times and the AQHA champion breeder title a record 12 times. As a breeder, Allred has raised many outstanding horses like Separatist, Make It Anywhere, Way Maker, Worth Doing and Making Ways, plus nearly all of his stakes winners. Quarter Horse racing caught Allred's attention for the first time in 1956 when he noticed in a Daily Racing Form article that the Allred Brothers were running Quarter Horses at Los Alamitos. Allred visited the Orange County track with his friend, Tom Seibly, and quickly fell in love with Quarter Horse racing. A few years later, Allred saved enough money to buy his first horse named Beowawe. Allred's interest in racing grew each year and in 1990, with the help of close friend R. D. Hubbard, Allred purchased one-half interest in Los Alamitos Race Course. On February 17, 1998, Allred became sole owner of the track.